Snipping Tool is a free screen capture utility that comes built-in in modern Windows operating system beginning from Windows Vista. It continues to be developed and improved since then with much more better versions in Windows 7, Windows 8, Windows 8.1 and especially Windows 10. Unfortunately, there is no keyboard shortcut or accelerator key press sequence been associated or assigned by default to Snipping Tool. Thus, users unable to quickly run the Snipping Tool when needed by just pressing keyboard keys without opening Start Menu or Desktop, or make a click or tap on Taskbar. However, by using feature in Windows operating system, it’s possible to assign or associate a keyboard shortcut to instantly launch Snipping Tool. In fact, there are two ways to do it. 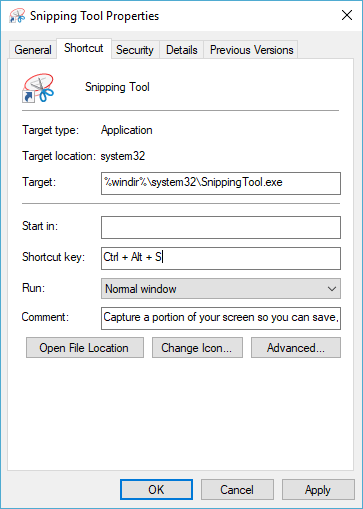 First method is by setting the shortcut key for Snipping Tool in the file properties of the Snipping Tool shortcut or icon in Start Menu, Desktop, Taskbar or any other place. To do so, right click on Snipping Tool icon on the Desktop or Taskbar, or Snipping Tool shortcut in Start Menu, and select Properties. In the Shortcut pane, there is a field named Shortcut key. Click on the text field after the “Shortcut key”, but you can’t type in text there. Simply press the keyboard accelerator keys that you want to use as the keyboard shortcut for Snipping Tool, and the shortcut keys will automatically appear in the text field. Note that only certain combination of keys can be used. Second alternative is to use keyboard shortcuts default on Taskbar (in Windows 8 / 8.1 / 10) or Quick Launch bar (in Windows 7 / Vista). To use this method, pin or place a Snipping Tool shortcut in the Taskbar (for Windows 10 / Windows 8.1 / Windows 8) or Quick Launch bar (for Windows 7 / Windows Vista, where Snipping Tool will probably prompt you to display icon in Quick Launch bar on first run, else you can set the preference in Snipping Tool options). Once Snipping Tool icon appears in Taskbar or Quick Launch bar, count its position from the left, and press Alt + (location number of Snipping Tool icon in Quick Launch bar) will run Snipping Tool instantly.